Despite Apple originally distancing themselves away from the 7″ screen tablet market, they have finally been drawn in to produce another fantastic tablet which again will push market leader, Samsung to the limit. The Apple iPad Mini manages to pack in all the same features and performance of the iPad 2, but packs it into a smaller shell, and displays it on a 7.9″ display. Although this display doesn’t have the Retina display of the other newer Apple devices such as the iPhone 5, 5th generation iTouch and New iPad, it is still very sharp and excellent quality. In fact, it is the fact that the screen display is smaller that the display is a big improvement on the regular iPad 10″, as it packs in more pixels per inch. Ever found the larger tablets a little cumbersome, and harder to handle? Even with good covers, they can still seem a little too big, and this is where the iPad Mini comes into its own. Not only is it around quarter of the size of the New iPad, but it is over half as light too. This means for reading, watching video or simply playing games, the device is so much more pleasant to use. If you don’t need the larger screen of a 10″ tablet, then this size is a fantastic compromise. The iPad Mini is primarily aimed to gain a market share of the 7″ Android devices such as the Kindle Fires, Barnes & Noble Nook Tablets and the Google Nexus 7. The battle between Android and iOS has been long documented, and while the Android machines hold certain advantages over the iPad Mini, it is still an Apple product, and so the build quality, familiarity, iTunes shop and stability are all things which Apple has over its competition. There is still to be a machine to compare to the Apple products in terms of feel, and actual quality. They are still number one in that regard. One advantage this Apple iPad Mini review highlights its advantage over the competition, especially with devices such as the Kindle Fire and the Nook, is that it is able to easily open media from other sources. The Fire is specifically aimed at merely being an extension of Amazon, while the Nook that of Barnes & Noble. The iPad Mini is able to download apps and iBooks from Apple Appstore and iTunes on Desktop., as well as easily being able to synch your own media to it. The price difference is there for a reason, the Apple iPad Mini is a superior machine. The original official list price of the iPad Mini from Apple starts from $329 $299 (Price dropped in Fall 2013) for the base wi fi only 16gb model. However, look out for iPad mini discounts and save even more. Apple has also taken a bit of a hammering regarding where its products are made, and impact to the environment. For those of you who care, Apple can claim improvements here, as the device now has a mercury free display. This means when the device is no longer needed, its harm to the environment is significantly less. Also, the glass is arsenic free, BFR and PVC free, and uses recycled aluminium for the casing. These are all significant steps towards producing a product that has a short usage life (all electronic gadgets really are only used for a couple of years at most before the next generation comes along to replace it), and so thoughts towards what happens to them and the environment afterwards are of high concern now. Overall, the iPad Mini is a great introduction for Apple in the mid size tablet market. Although it doesn’t feature the same Retina resolution screen as the latest Apple portable products, the fact that it is smaller than the iPad 2 means the display is crisper and superior to it. 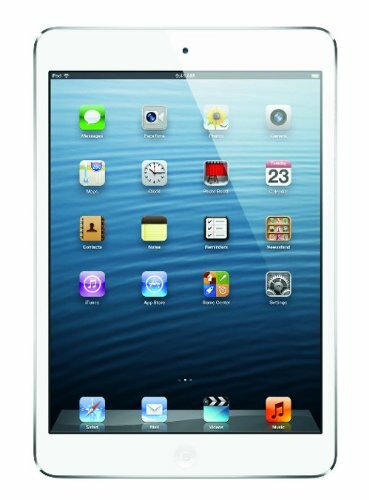 In fact, the iPad Mini could be considered in many ways as a smaller version of the iPad 2. It’s speed, capabilities and size mean it is a great product to own, and this Apple iPad Mini review will conclude by saying it is well worth the money. Best Kindle Books for July: Happy Birthday, America! Compare Fire HD 7 (2014) vs Kindle Fire HDX 7 (2013): Which one is the best Fire Tablet in 2014? Kindle Daily Deals: An assortment of mid-week treasures. Best Kindle Books for Reading in April 2018. Spring has Sprung!